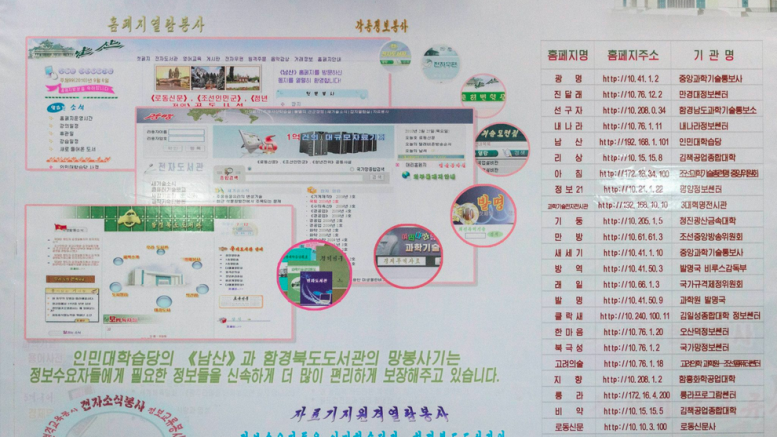 A poster showing intranet addresses used in North Korea, posted by Aram Pan on DPRK360. Not much is known about North Korea’s intranet — the Internet-like system that links up libraries, universities and other organizations throughout the country but goes no further than the country’s borders. Few foreigners get a chance to access it and delve into the websites and services it offers, but thanks to sharp-eyed Aram Pan and his DPRK360 Facebook page, we now know a little more. The Singaporean photographer spotted this poster on the wall of the e-library in Rason in the country’s north east. It details some of the sites available from computers in the facility. One of the most noticeable things is that the website addresses are in a numeric format. Computers use these numbers, called IP (Internet protocol) addresses, to route traffic. To make addresses easier to remember for humans, domain names were invented, but computers still take those and convert them to a numeric address uing DNS (domain name system). DNS appears to be in use in North Korea. The North Korean Samjiyon tablet PC had several default bookmarks in its web browser that used domain names. But in many photographs from libraries and other institutions, desktop browsers appear to be using numeric address. This could be because DNS is only available on part of the network, or it could be because the numbers are actually easier for people to type in. If you don’t have much experience with the roman alphabet and a computer keyboard, typing a short string of numbers is probably easier. The second thing to notice is the addresses themselves. While the IP address system was designed so that every computer on the Internet has a unique address and is internationally accessible, the North Korean addresses exist in gaps in the IP address system that are reserved for local networks. These are used on private networks and aren’t accessible from the Internet, so don’t bother clicking the links. They won’t work. North Korea’s intranet is, in effect, very similar to a corporate network but on a national scale. The third observation I have from this list is how much it looks like the Internet in the early 1990s. Back then, before commercial interests flooded the web and millions of people came online, most of the sites were from universities, government research institutes and public organizations. ?? Bangyong http://10.41.50.3 ??? ?????? ?? Invention http://10.41.50.9 ??? ??? ???? Woods of Korea http://10.76.1.18 ???? ???????-??????? If you can help with providing, updating or correcting and of the translations, please email me. 6 Comments on "A peek inside North Korea’s intranet"
HOW DID WE USE NORTH KOREA’S INTRANET FOR COMMERCIAL PURPOSES? That’s the Naenara (“our country”) site; the one accessible from the inTRAnet, since it looks different from the one on the inTERnet (naenara.com.kp). The URL bar reads “http://10.76.1.11/eshop/” which correspondents to the above list. The page displayed appears to be an online book store. May I ask where you found the picture?